If you are frustrated against to receiving day to day missed or fake calls on your reliance mobile phone from any unknown reliance number. If you want to know information like surname of that person who is trying to irritated you, then you can use following given steps. You can get any valid reliance mobile number information easily. In this article I am providing you a website that can help you to get user lastname or little information about reliance mobile user in few simple steps. This website is not only recharge your reliance mobile number but also helps you to get detail of the user which have any valid reliance number. Try it…..
Click given link below to this line to easily find out any reliance user surname by submitting his valid mobile phone number. Step 2. 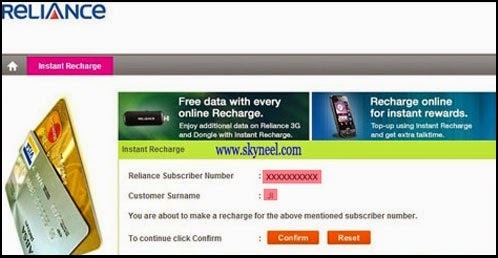 Enter the any valid reliance subscriber mobile number of whom you details to want to view on the screen like customer surname. Step 3. Enter any fake email id. This part is optional. 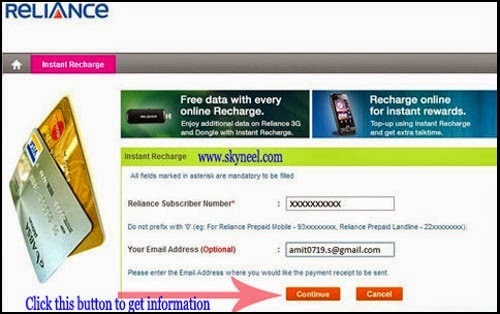 But you are a valid user and want to recharge your registered reliance mobile number then you have to give your valid email id information to get recharge payment receipt. Step 4. Click on the Confirm button, if you want to continue and also want to view the reliance subscriber surname. Step 5. Now you will get a screen with the reliance mobile number and the customer surname. You can also get following four options which you can use to instant recharge your reliance mobile like Topup / Talktime, Tariff Plan, Packs and GPRS / Data. I hope you like this post, please share your knowledge with other and send your important suggestions in the comment box. Thanks.